It’s clear Marlene and Jeff have a passion for food and for sharing everything they know about it, from interesting ingredients, to cooking techniques, to the whole dining experience. It was not just learning, but lots of laughing too! This is a great way to learn how to cook dishes that seem like they’re reserved for restaurant dining. The environment is super comfortable, the hosts are inviting, and we got to enjoy the amazing food (that we helped prepare) with new friends. What’s not to love? It was a wonderful experience. Marlene and Jeff were great hosts and great teachers too! Last evening was a lot of fun- terrific food, presentation and a lovely group to be sharing dinner and conversation with. Dan has already signed us up for your Asian cooking class for early February and we are both looking forward to it! I totally appreciate the work that you and Jeff put into the evening. It did not go unnoticed. Thanks again!! If you’re looking for a fun way to tune up your culinary chops and meet some like-minded individuals, check out the Refined Cook culinary series! A delightful way to spend an evening. I love the Refined Cook class, first of all the atmosphere is very friendly. Second the level of professionalism is great, and the fact that we have the chance to get involved in the process was super, and of course to taste the amazing food is a plus. I consider myself a good cook and wasnt sure what exactly I would learn from this cooking lesson. But learn I did. There were some technical tips, some food buying tips, and I made dishes that I had never made before which was great and expanded my repertoire. The atmosphere was congenial and supportive. And the food was absolutely delicious! 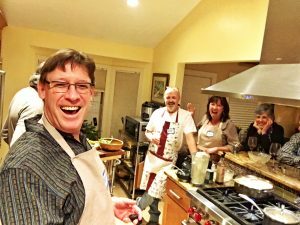 I highly recommend Marlene and Jeffs cooking classes and plan to take some more! I attended a cooking class with Marlene and Jeff last Friday and had a great time! They are very knowledgeable cooks and I came away with a refreshed enthusiasm for cooking for myself. I learned some great new techniques on preparing meals and also a better understanding of the right equipment to use. It was a great hands on experience and the food was fantastic! This is a fun and interactive way to spend an evening. You will pick up a few cooking tips and pearls and you will have a relaxing time with the friendly hosts! Every aspect of the evening was amazing from the Hosts, to the informative and relaxing cooking lesson to the delicious food that we helped prepare.